In a culture deeply enamored with fear and the Unknown, many of us find ourselves needing to confirm or deny things we can’t explain. The paranormal can evoke fear and curiosity in some, while others simply dismiss it. Despite these contrasting views, the Unknown never ceases to spark controversy, and whether you believe in ghosts or not, who doesn’t love a thrilling ghost story? My obsession with the paranormal started with my mother’s affinity for ghost stories, and my dad’s dismissal of it all as a “bunch of garbage.” Throughout my childhood we were members of a haunted library and lived in the woods full of spooky folklore-monsters and lost towns full of the Unknown. We always sought out the most interesting ghost stories, so of course, growing up we always had a Ouija board. Because what better way to seek the best ghost story than to take the reigns and be a part of one yourself? After one memorable experience where a spirit my mother spoke to knew information about some eerie family history, my mom was so spooked she hid the board under my bed (thanks, Mom). There it stayed for several months, without my knowlege, and in those few months I had temper tantrums so violent that I made the lights flicker. At the time I attributed those melt-downs to my angsty, “woe-is-me” teen years. The superstitious side of me has always known that we had experienced our own ghost story, which only further sparked my curiosity about the influence of the “other side” and what worlds the Ouija is able to bridge. Several years later, I found myself moving to Baltimore, which just so happens to be the birthplace of the Ouija board as we know it today. And recently, I found myself scoring an interview with the man who has literally rewritten Ouija’s history: Robert Murch. Murch is an avid collector, historian, and the Ouija and Talking Board connoisseur. No one else even comes close to Murch’s talking board collection, consisting of, “Well over 500 different boards, that doesn’t include variations. The boards change over time, and that can be into the thousands,” he explains. But Murch doesn’t just collect boards; he compiles all things Ouija, Talking and Witch board, from sheet music and poetry books, to newspaper articles and even the foot stone of William Fuld—the Father of the Ouija board. But most importantly, Murch collects stories. Since then, Murch has spent more than half of his life with the Ouija Board. Initially, his journey began wanting to clarify the discrepancies in all the documented history of the board. “I had to go to the library and actually open an encyclopedia, and every entry on the Ouija board said it came from somewhere else,” he says. “Everyone knows what it is, and everyone knows how to play it, and everyone has their story, and yet we don’t know where it comes from.” Now, Murch’s home is stockpiled with all things Ouija, that he’s found on his own and through the help of the Ouija’s ancestors. Throughout Murch’s Ouija odyssey, he’s found that the real story behind the board lies within the hands of the originators. “That has been my biggest focus, on those people,” he explains, “because that’s where they tell the real story. It’s unbelievable how much they’ve kept, whether it’s photographs or letters.” Much of his work has actually focused on genealogy, connecting the dots that time has left unanswered. In joining these dots, Murch has uncovered quite a few answers that have filled in so many gaps in the Ouija story—including the discovery of the unmarked grave of Elijah Bond, the man who patented the Ouija board with Charles Kennard, who is one of two men credited with coming up with the Ouija game idea. “I found this unmarked grave, and two weeks later I found his great-grand-nephew, who was alive and 99 at the time,” Murch remembers. “He gave me permission to put in a gravestone for Elijah at Green Mount Cemetery.” He then worked with various other collectors and historians in order to raise the funds for the tombstone. This collaborative and historical effort was the beginning of the Talking Board Historical Society. The gravestone in question is one of the most visited stones in the cemetery including the grave of John Wilkes Booth. Why? Because the tombstone has a Ouija board carved into it, and what is cooler (and creepier) than that? “Once I got permission to do that, I realized that most of this hobby was sharing and collaborating with other people, because the research is crazy,” Murch says. There is no better way to describe the innumerable hours he’s put into this adventure, and I think Murch couldn’t be prouder of his insanity. Murch is also the Chairman of the Board at the Talking Board Historical Society—which was created to research, protect and celebrate this history that has been lost for a long time. 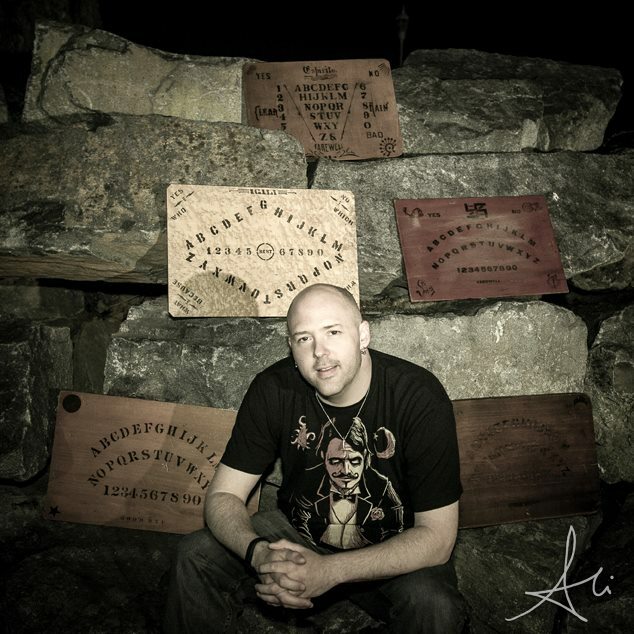 As with any historian, one of Murch’s driving forces has been to preserve the history of the Ouija, even if that means rewriting it over 100 times. These goals in mind, the TBHS is hosting its inaugural event: OuijaCon—a conference to celebrate 125 years of the paranormal and history of talking boards, in the city where Ouija was incepted. With festivities ranging from lectures, workshops, and a temporary museum showcasing over a century of talking boards, the conference promises to entertain believers and skeptics alike. To kick off the event, the TBHS has worked closely with the city to unveil a plaque at 529 North Charles Street (which just so happens to be a few buildings down from What Weekly HQ), with a mayoral proclamation. This location is the exact spot where the Ouija was named, this month, 125 years ago. The plaque aims to set straight the myth behind the board’s puzzling name, and memorialize the rich Ouija history Baltimore has to offer. 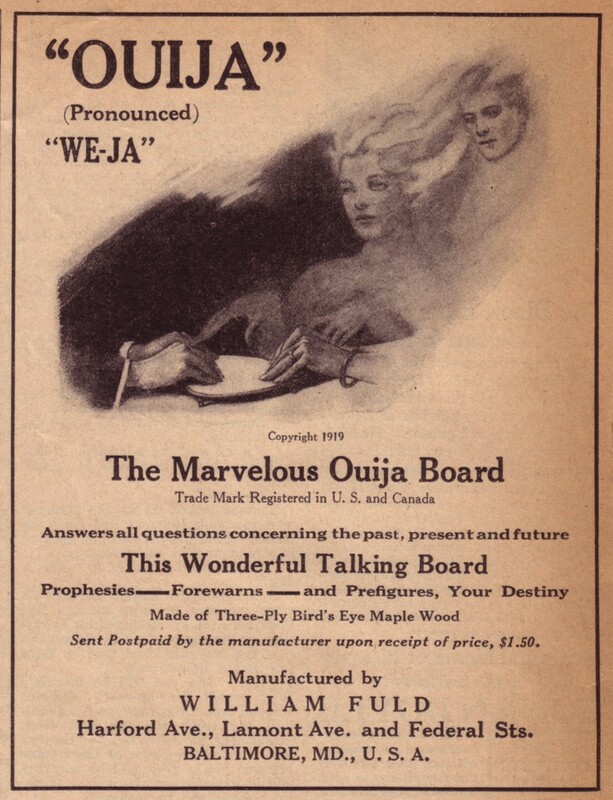 “We use to think that Ouija was the combination of the French and German, ‘Oui’ and ‘Ja’,” Murch says, “It turns out that’s not true.” Instead, the real story was uncovered in letters from the Ouija originators in 1890 published in the Baltimore Sun that discussed the naming event. Legend has it that the board simply named itself with the direction of a female medium, in what has otherwise been a male-dominated history. 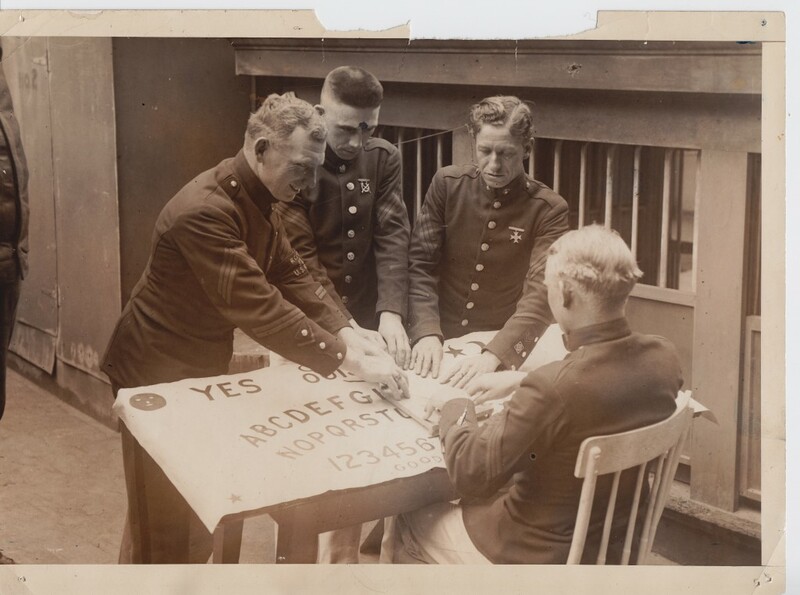 In the meantime, Murch and his gang of merry Ouija-enthusiasts invite Baltimore to celebrate the Unknown in the city that helped spark the history surrounding this mystifying board, and maybe even be a part of your own ghost story.